Through the songs of her debut album ‘Burn The Sky Down’, Australian songstress, Emma Hewitt, hopes to take the listener beyond the expected, something which she strives to do with her forthcoming single ‘Crucify'. Warmed up by her previous tracks ‘Colours’, ‘Rewind’, ‘Foolish Boy’ and ‘Miss You Paradise’, ‘Crucify’ is an emotional beat-ballad with sharp edges, sweeping violin and the characteristic voice of Emma to guide you through the dark hours. 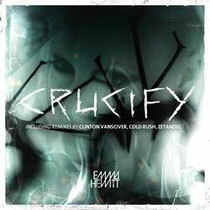 The official ‘Crucify’ remix contest brought an abundance of quality remixes, but the one that stood out most, was the Cold Rush remix. The Estonian duo of Erkki Abel and Robert Roost were named the winners and their remix is driven by a dark, proggy depth, but also unfolds a warm, synthy break. Ukrainian producer Zetandel provides a warming Chillout remix, while LA’s Clinton vanSciver turns the track into an eclectic affair of electro-house, prog and melody.